I usually make this dip and serve it warm. But when I came across this recipe which is served at room temperature, I thought I'd try it. Plus, it uses mustard as an ingredient which my go-to recipe does not. I thought it would be fun to try a new recipe for a change. 1. Combine all ingredients except bread crumbs in medium bowl. 2. Sprinkle toasted bread crumbs over dip just before serving. 3. Serve with tortilla chips or crackers. 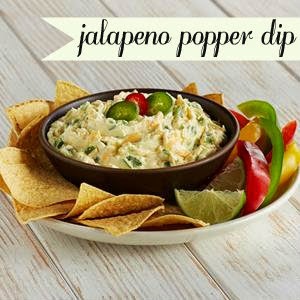 *For a hot dip, place dip into a 1-quart ovenproof dish. Top with bread crumbs and bake at 375 degrees Fahrenheit for 20 minutes or until hot.